Anyone flown through Terminal 3 at JFK on Delta lately? Fortunately, that miserable experience is soon coming to an end with the opening of Delta’s new Terminal 4 expansion in May. 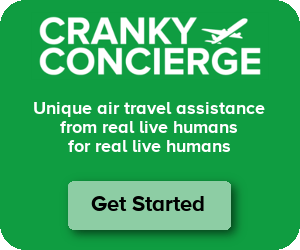 Justin Harrison works with SmartFlyer, a travel agency in New York that we affiliate with at Cranky Concierge. He was given a sneak peek of the terminal as they work to get it ready to open and I’m happy to be able to share his write-up and photos here with you. On May 24, Delta will be opening its expansion of Terminal 4 at New York’s JFK Airport with some incredible new features for travelers. Among the most exciting features are the 24,000 square foot Sky Club, an open-space TSA checkpoint, and the unparalleled Sky Deck. Doreen Baron of Delta NYC, and Harry Olsen, the on-site program director, were kind enough to give us a behind the scenes look at what Delta has in store for their loyal fliers. Harry and his team have been diligently working on T4 over the past two years, and their efforts to make Delta’s presence at JFK shine more so than before are immediately obvious. Delta has check-in kiosks conveniently located upon entry to the terminal, even manned kiosks curbside for preferred travelers, and they’ve installed a sharp red-walled area for Sky Priority members to check-in quickly. Proceeding through check-in reveals a short walk to security, which is refreshingly open and actually appealing (as much as a TSA checkpoint can be); the multitude of lanes seems to lend itself to a speedy process. Security is within the main building, and the soaring ceiling and open space helps the area stand out from the typical claustrophobic experience. Presented with a stunning closeup of the 320 foot high control tower after clearing security, passengers proceed through the open shopping area on the floor below while heading to their gates. On the way they will pass by one of Delta’s most exciting additions, the new Sky Club. The expanded concourse holds the new Sky Club lounge, which is 24,000 square feet in size and will hold two spa rooms, a cafe, multiple sitting areas, and a full service bar. The main draw, however, is what’s happening outside, literally, on the Sky Deck. The Delta Sky Deck will allow those with access to the Sky Club to enjoy the comings and goings of aircraft at JFK from an unsurpassed view, all the while enjoying the absolute finest service that the carrier has to offer. While we were there it was still being constructed but were told that it would hold up to 45 people at a time. While on the roof by the unfinished structure we were close enough to hear the planes touch down on the runway, and a sea of Delta tailfins were lined up at the gates behind us, almost within reach. Hands down frequent travelers will be amazed at the sights and amenities this new addition has to offer. The new concourse also has good things in store for all regular Delta fliers as well; each seating area in the expanded terminal area includes multiple power ports and USB ports for each seat. There are no awkward power stations to be found here, glaring and huddled around by those hoping to get a last-minute charge before flight time. Instead there are only aesthetically pleasing seating areas built with convenience in mind from the outset for each and every traveler. Delta clearly has an eye firmly fixed on the future of every flier’s wants and needs at JFK, and is clearly adept at meeting each and every one of them, aiming to keep every process speedy and comfortable. For an official rendering of what Delta’s put in place, watch the video below, and prepare to get excited about what the near future has to offer on your next trip through JFK. Justin Harrison is the Corporate and VIP Account Executive with SmartFlyer. You can learn more about SmartFlyer on Facebook and on Twitter @theSmartFlyer. Shiny and new. . . .those seats are the same as they put in at Sacramento’s new airport. They are frickin awesome. . .
Really looks great, it should be a greatly improved experience for elites and regular travelers alike. Of course, DL benefits from having set an extremely low bar at JFK via T2 and T3! T2 flyers will be jealous, that is for sure. Agree that it looks cool. Does anyone know how the logistics work? Do the current T2 and T3 become 4? Behind? Next to? And will the current JFK Terminal 4 – international flights – be renumbered? Neil S – T3 gets demolished but T2 stays as T2. I don’t think there’s any renumbering planned. There will now just be no T3 (or T6 for that matter). Originally they were going to have a walkway between the two terminals, but now it will be busing instead (bleh). That shiny new “open plan” security checkpoint will only be as good as it gets staffed. How many times in the last ten years have we seen airports open massive new checkpoints with a dozen lanes, only to watch TSA staff three of them and lines of passengers back up? Same thing happens any time an airport builds a shiny new FIS/Customs hall. In these budget-conscious days I’m highly skeptical that we’ll ever see that checkpoint running at full capacity. Beyond that gripe (which is out of Delta’s control) kudos to DL for finally fixing its most glaring facility issue. JFK still feels overcrowded, but the aesthetic appeal of the airport’s terminals has been completely transformed over the last decade, and that’s always a good thing. I’d say look to T5 as an example. When it opened, it had more lanes than any other checkpoint in the US. Even during the holidays when Jetblue has lines spilling out of the terminal they are so long, TSA does not open every position. My first thought about the large security checkpoint area was the same as James S said, it’s only good if they use all the lanes. It will be all nice and new, but it will still be JFK, so does it all really matter? How many total gates will Delta have at T4, as T2 has 9 & T3had 18 before closing. Today’s cutting edge architecture often becomes dated. That’s what it looks like to me. But it’s an airport. What does one expect? The important thing is the building’s functionality. And it looks like Delta has hit a home run in that department. Bill Hough – You act like this is some super secret conspiracy. Delta has always been clear that T3 is going, and I couldn’t be happier. It is a dump. Could it be restored to how it looked back in the glory days? Probably, but considering what’s been done to it over the years, I can only imagine that being an insanely expensive proposition. It doesn’t seem worth it to me, and it certainly wouldn’t be worth the investment for an airline that isn’t going to use it. If you want some Pan Am nostalgia, you can always go to the Marine Air Terminal at LaGuardia. I guess you and I will have to disagree on this issue. Those bean-counters at DL refuse to differentiate between the ugly addition, which needs to go, and the Ives, Turano & Gardner designed “historic Flying Saucer” from 1960. The latter should be saved for adaptive reuse. Fixed up, the former PA building would be a nice nod to the “Jet Age” as is the TWA flight center. New York failed to stop the destruction of another landmark transportation facility, Penn Station, and almost lost Grand Central in the 1970s. By some miracle, they saved TWA. DL should find a way to save the building and market it to its advantage. Having been in T3 on myriad occasions, I thought you were nuts until I realized you were just talking about the saucer portion which would seem to be a candidate for adaptive reuse along the lines of the TWA Saarinen terminal that was incorporated into the B6 T5 project (sorta). If nothing else, it would seem to me that it could be used for a handful of additional gates the way it was originally set up (and a way to connect T2 to T4 since T2 and T3 are already connected). Buses, really? Blech! I think you’ve hit on the problem, which is confusion on what people feel should be saved. It doesn’t help that the group of preservationists use the term “Save the Worldport,” forgetting that the term “worldport” was introduced by PA when they expanded the terminal to support PA’s 747 operation. The movement might get a bit more traction if it were made clear that it’s only the saucer that should be saved and re-used. If it were tastefully fixed up, DL could make it part of their NY marketing. Thanks Bill. Yeah, it seems the messages are definitely mixed and I think using Worldport is part of the reason. People who are familiar with that terminology from the old Pan Am days or its current decrepit iteration don’t quickly make the distinction that your cause pertains to just the historic “saucer” portion and not any of the slapdash additions. Fortunately, the Pan Am Worldport has been put on the National Trust for Historic Preservation’s list of America’s 11 Most Endangered Historic Places for 2013! This is a very important accolade for the “Save the Worldport” [www.savetheworldport.org] group’s long effort to rescue the original “saucer” portion of the Pan Am Worldport as well as the Milton Hebald Zodiac bronzes that were attached to the windscreen. Sadly the first thought I had about the security area was that I hoped it didn’t turn into a T-5 situation. Apparently I’m not alone in that evaluation! New facility looks great and I’m excited to check out the Sky Deck…the loss of observation decks in the post 9-11 is still something I haven’t quite gotten over! Delta has done a wonderful job in New York overall. Laguardia is efficient and pleasant and the New JFK gates will be awesome! Well done Delta and a good article on the progress…. Is part of this T4 expansion going to allow you to go from the AirTrain to the terminal without having to go outside/cross streets like you have to now for T2/3? PeteyNice – The expansion is just the lengthening of the existing concourse, so it doesn’t really change the AirTrain access. I believe in Terminal 4, it goes right into the terminal, or at least under the same roof. For Terminal 2, however, you’ll either have to go into T4 and take a bus or you’ll have to do the same way of doing it as today. Do you know if there’s enough room to expand T4 further so that T2 can also be demolished? We’re only looking at a wing with 7, 8 or 9 jetway gates in that case. SEAN – I think we’re looking at 10 jet bridges that will be operational in T2 after the regional gates all get pulled down. So, could they create another wing of T4 the would go west? Probably, though they would lose a gate or two in T4 during the process. But sure, they could do it. I think the thing is that T2 is in decent shape. It’s just not in the most desirable location. Would think they could probably get the same 10 bridges onto the T3 saucer (the way it was set up before the ghastly additions) and have it directly connected to T4, freeing up T2 for use by another airline(s) and preventing DL from having to have duplicative checkin areas in two separate terminals and having clumsy buses to get passengers back and forth. Just seems to me this was not very well thought out in terms of maximizing the JFK real estate, even if you disregard the historical T3 saucer considerations entirely. Looking good, thanks for posting this! Coming soon …the 1st 21st century Global airport.